the basic frameworks of understanding’ or ‘principles of organization of experience’ for making sense of social events (GOFFMAN, 1974). Frame analysis refers to ‘the examination of this organization of experience’ in general and in particular terms (e.g. what makes a joke a joke, or a mistake a mistake), and to the ‘vulnerabilities’ to which any frame is subject. (or skeleton), in engineering, the shell of any product, structural element, building, or installation; it consists of separate beams that are attached to each other. Frames are made of wood, metal, or reinforced concrete. The frame determines the strength, stability, durability, and shape of a product or installation. Strength and stability are provided by rigid attachment of the beams in interlocking connections or hinged joints and by special stiffening elements, which give the product or installation a geometrically invariant shape. The rigidity of frames is often increased by sheathing, casing, or walls on the product or installation. The skeleton of a building consists mainly of columns and of crossbeams, girders, and trusses, which rest on the columns and on which the ceiling and roof are laid. Depending on the type of building in which they are used, frames may be single-stage or multistage; one-bay, two-bay, or multiple-bay; and with the main load-bearing structures placed transversely, longitudinally, or in both directions. The skeletons of buildings may be complete or incomplete: a complete skeleton absorbs all vertical stresses of the building, and the elements of the skeleton are found throughout the building layout; an incomplete skeleton is placed only within a building in which the outer walls are load-bearing and, together with the skeleton, support the building. According to the way in which overall rigidity and stability of buildings are provided, a distinction is made between frame-type skeletons, in which the interlocking connections of the columns and crossbeams are rigidly constructed as frames capable of absorbing deformation moments and transverse forces from wind load and dead load, and skeletons with ties having articulated or partially binding joints, in which wind loads are absorbed by rigid horizontal and vertical stiffeners. Drozdov, P. F., and I. M. Sebekin. Proektirovanie krupnopaneFnykh zdanii (karkasnykh i beskarkasnykh). Moscow, 1967. (1) A photograph on film with the image of a phase of motion or the static position of the objects being photographed. The linear and spatial design, the brightness and color values, and the nature of the optical image in a frame, as well as the boundaries of the space depicted in the frame, are all dominated by the development of the idea and by the content of the scene being photographed. The design of a frame takes into account the qualities of dynamic composition that are influenced by the motion within a frame of the objects being photographed. When a moving camera is used, such motion is often combined with the motion of the frame itself. The format of a frame and its relative location on the film are determined by the dimensions and location of the film gate of the camera. The dimensions of frames with a sound track produced on standard 35-mm motion-picture film are as follows: height, 16 mm; width, 22 mm; aspect ratio, 1:1.375. For frames on wide, 70-mm film the aspect ratio is as high as 1:2.2; for the frames of a wide-screen film the ratio is 1:2.35. (2) A sequence frame (sequential section) is a component part of a film that contains a moment of the action as photographed by a moving or stationary camera. Each sequence frame must be organically and compositionally linked with adjacent frames in terms of the content, continuity of subject, and choice of composition, rhythm, and color values. (3) A scene frame (in screenplays used in producing films) is a narrative of contents and a detailed description of the frame being filmed, the action taking place in the frame, the dialogue, and also the sound track and the acting and staging decisions. (4) A photographic frame is a single image of an object being photographed, with boundaries limited by certain dimensions. The boundaries of a frame are determined during photography during printing on photographic paper, or in the production of slides. (5) A televison frame is a complete single televison image. It is composed of two partial images, the half-frames or fields. The odd-numbered lines of the picture being scanned are swept consecutively by the first field; the even-numbered lines (located between the odd-numbered lines) are swept by the second field. The number of lines in a frame varies; it is determined by the parameters of the television system (525, 625, 819 lines, and so on). Video signals modulate the electron beam in a picture tube only during forward sweep of the beam in scanning; during the return sweep the beam is extinguished and returns to the starting point of the next field. The field frequency is chosen to equal the nominal frequency of the power-supply line. For a frequency of 50 hertz (Hz) the frame is transmitted for a period of 1/25 sec; for a frequency of 60 Hz, for a period of 1/30 sec (or, one field for 1/50 or 1/60 sec, respectively). The number of frame changes per second n, the nominal number of lines z, and the line frequency fc exhibit the following relationship: n = f jz. The ratio of frame width to frame height (aspect ratio) is usually 4:3.
also of metal or wood. 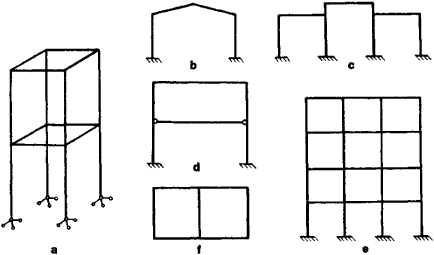 A distinction is made between braced frames (see Figure 1, a), which are three-dimensional, and bent or portal frames; the latter are distinguished by a great diversity of design (see Figure 1, b, c, d, e, f). Frames are usually designed by the general methods of designing statically indeterminate structures: the moment distribution method, the slope-deflection method, and the combined method. In the design of complex frames such as skeletons of multispan, multistory structures, approximate methods of calculation are employed. Such methods are based on the approximate method and on the simplification of structural modes by, for example, disregarding the movement of joints in the design for vertical loading. The skeleton structure of a building. Also known as framing. One cycle of a regularly recurring series of pulses. An elementary block of data for transmission over a network or communications system. One complete coverage of a television picture. A rectangular area representing the size of copy handled by a facsimile system. A single complete picture on motion picture film. The timberwork or steelwork that encloses and supports structural components of a building; see bent frame, doorframe, space frame, window frame, framing. i. In photography, any single exposure contained within a continuous sequence of photographs. ii. Transverse structural members of the fuselage supporting the longerons. A fuselage normally is divided into numbered frames. The number 1 frame is at the nose of the aircraft and subsequent frames are toward the rear. A data link layer "packet" which contains the header and trailer information required by the physical medium. That is, network layer packets are encapsulated to become frames. (language implementation) See activation record. One complete scan of the active area of a display screen. Each frame consists of a number N of horizontal scan lines, each of which, on a computer display, consists of a number M of pixels. N is the vertical resolution of the display and M is the horizontal resolution. The rate at which the displayed image is updated is the refresh rate in frames per second. (1) In computer graphics, one screenful of data or its equivalent storage space. See frame buffer. (2) In video capture, storage and playback, a single image in a series of consecutive images. See full-motion video. (3) In communications, a fixed block of data transmitted as a single entity. In local area networks (LANs), the terms frame and packet are used synonymously. See packet and Ethernet. (4) A separate window on a Web page. See frames. (5) In desktop publishing, a movable, resizable box that holds a graphic image. (6) In telephony, a rack for holding equipment, typically 23" wide by eight feet high. See rack mounted. (7) In AI, a data structure that holds a general description of an object, which is derived from basic concepts and experience.